Our respective Facebook posts nicely demonstrated the ying and yang of male and female thinking. 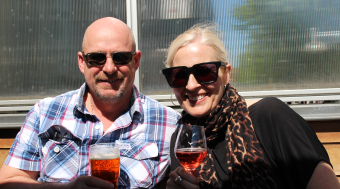 Rob called it a “dirty weekend away” and I reflected that “romance was not dead”. 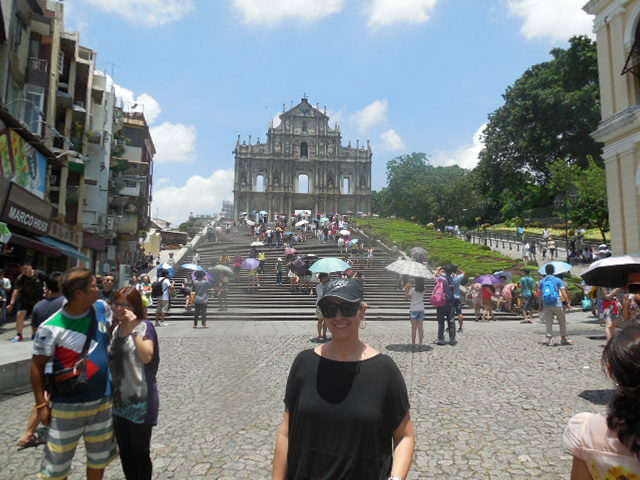 Either way, we found ourselves flying from separate locations – he from Indonesia and I from Australia – to meet in Macau for four days of frivolous fun. Our first key learning is that once you pass through immigration (for that romantic run-to-each-other embrace), you’ve lost the chance to catch the ferry direct from the airport and by-pass immigration. This means you find yourself the A11 bus to the other terminal (approximately 30 minutes away) to jump on the next available ferry. 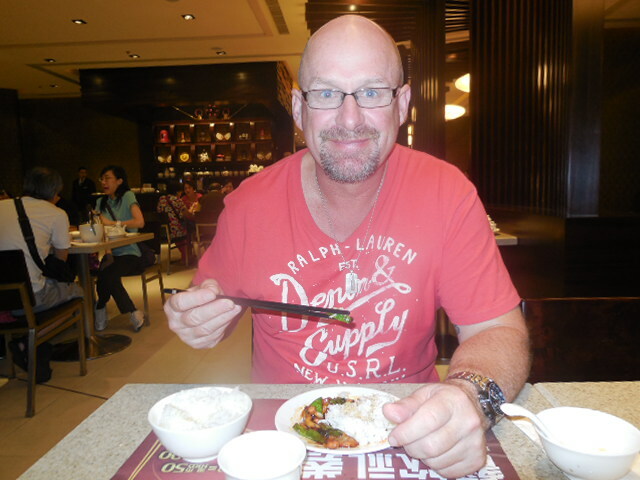 It’s then a one hour choppy boat ride to the ‘Las Vegas of the Far East’. 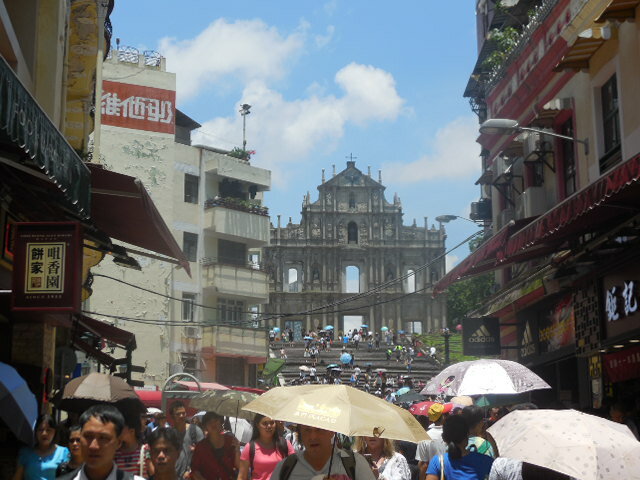 Macau is a magical blend of Portuguese and Chinese culture and influences – architecture, food and people. 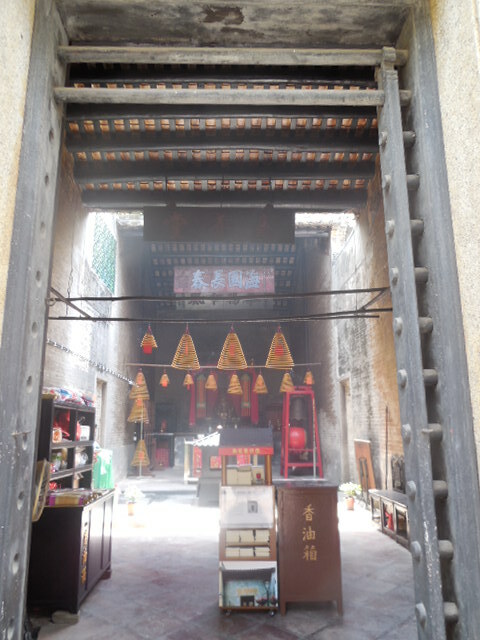 The Portuguese first settled in Macau during the mid-sixteenth century by paying an annual rent to the Chinese government. After about three hundred years of relative peace, Portugal decided to stop paying China in 1849 due to economic and political reasons at the time. 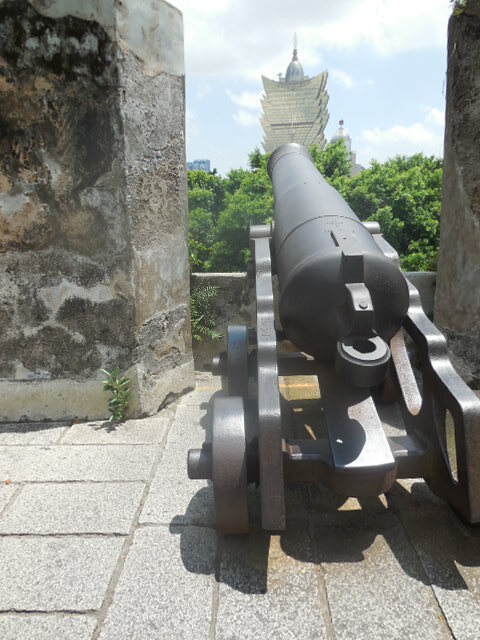 Portugal then invaded other areas of Macau under Chinese control and declared the entire region as an independent Portuguese colony. 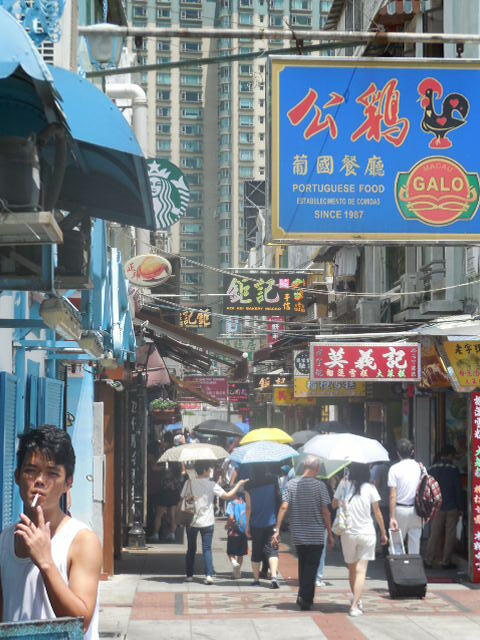 In 1999, Portugal returned Macau back to Chinese sovereignty where it is now governed as a Special Administrative Region (similar to Hong Kong). 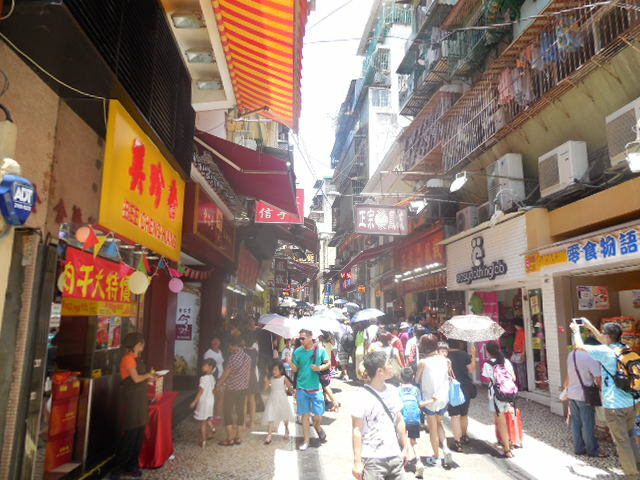 This also means that you are required to pass through immigration in both Hong Kong and Macau (if visiting both areas in the one stay) and that both regions have their own currency. 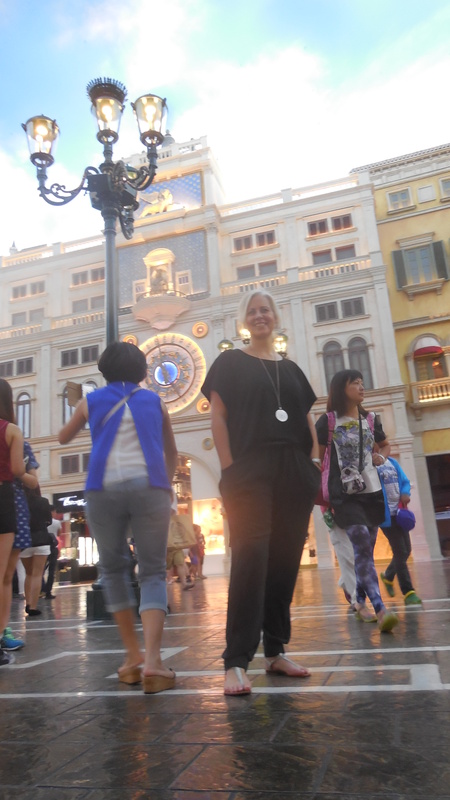 We stayed on Taipa Island, and specifically, the Venetian Hotel (the largest hotel in the world). 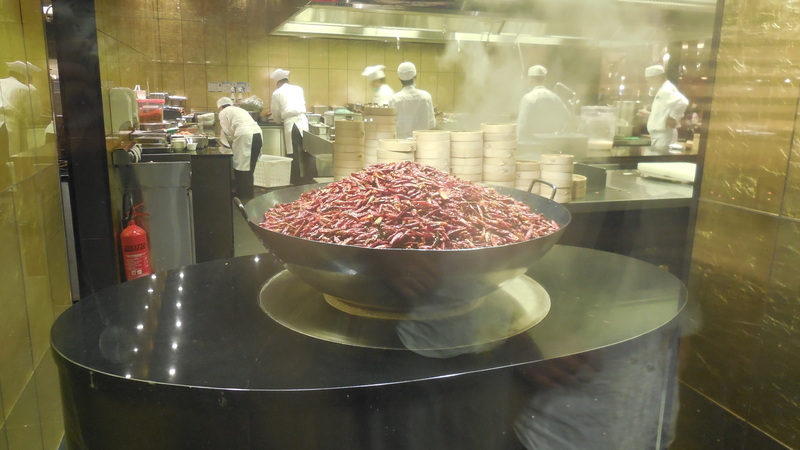 Here’s our top five suggestions for a fun weekend in Macau. 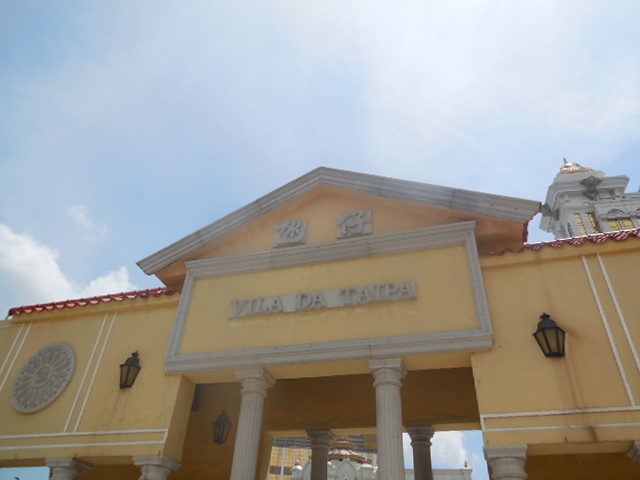 Immediately opposite the Galaxy Hotel and a short stroll from the Venetian is Taipa Village, a charming enclave that houses rows of rustic, candy-coloured Chinese/Portuguese restaurants and shops. 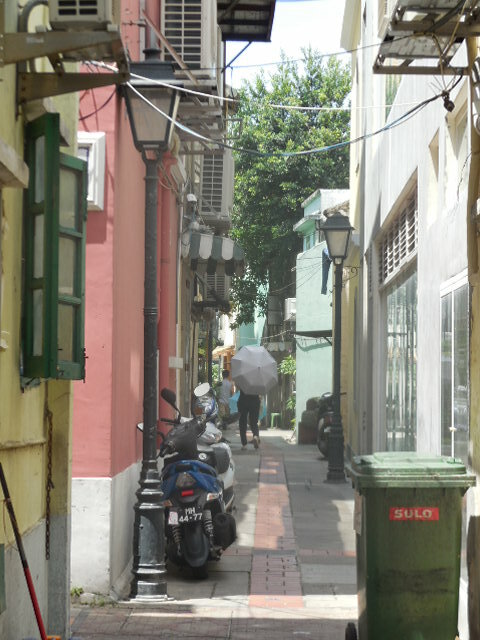 You’ll find lots of good food along Rua Do Cunha or along any of the narrow alley ways. We stumbled upon Casa do Antonio, a Michelin star authentic Portuguese restaurant and highly recommended. One step inside though and we realised that our sweaty shorts/t-shirt and backpack attire was better suited to the Spanish Tapas directly opposite. 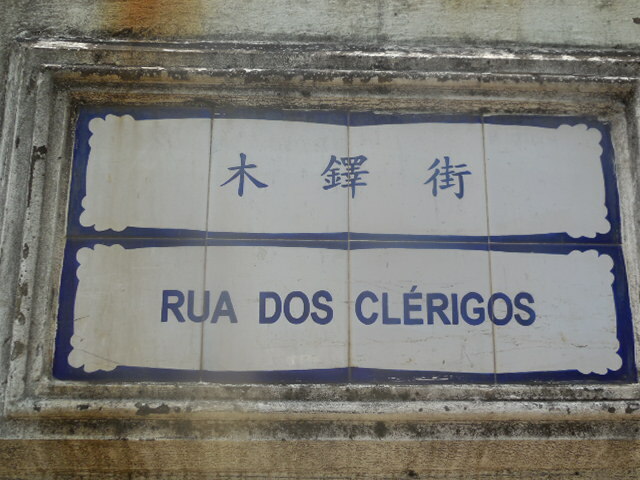 This may be the only place in the world where you can walk past a sprawl of traditional Chinese shops and temples, turn the corner, and find yourself amongst Portuguese-styled buildings. Pretty cool really. Method One: You can reach Taipa Village by taking the free shuttle bus from the City of Dreams Hotel or the Galaxy Hotel. It should take around five minutes. Alternatively, it is literally a 5-10 minute stroll across the road from the Galaxy Hotel. Method Two: You can cab it. We found the cab fares reasonable and they only charge by the meter (ie no haggling). 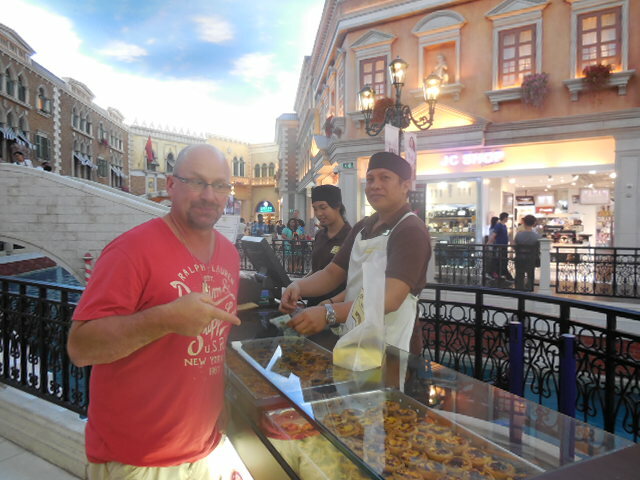 Macau is often touted as the “Las Vegas of the Far East” and it’s clear the mainly Asian visitors take their gambling very seriously. 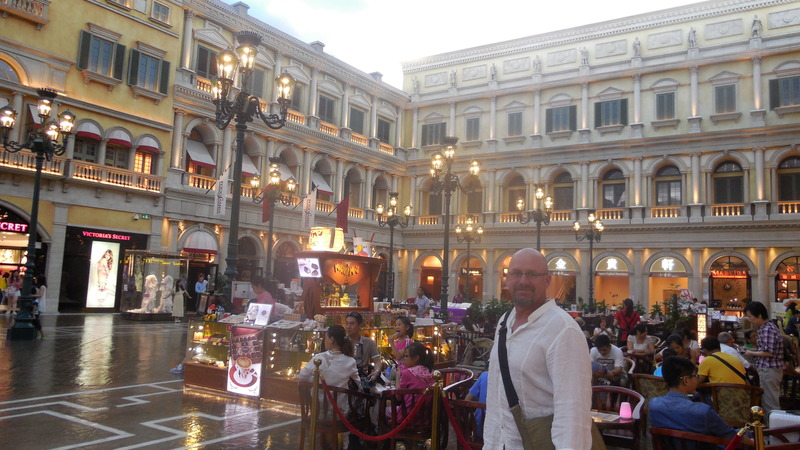 There are thirty-three casinos in Macau, spread across the two islands – Taipa/Cotai and Macau Peninsula. I’ll declare my hand early – we’re not big on casinos or gambling. 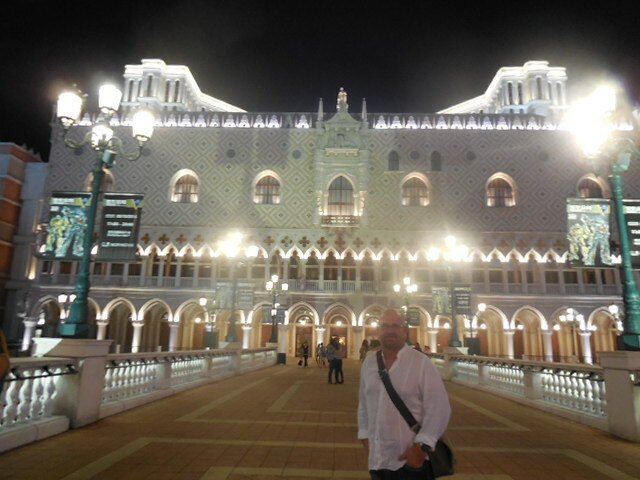 That said, the towering – and super ostentatious hotels – are on a par with those in Vegas and rather impressive. Even more so at night. 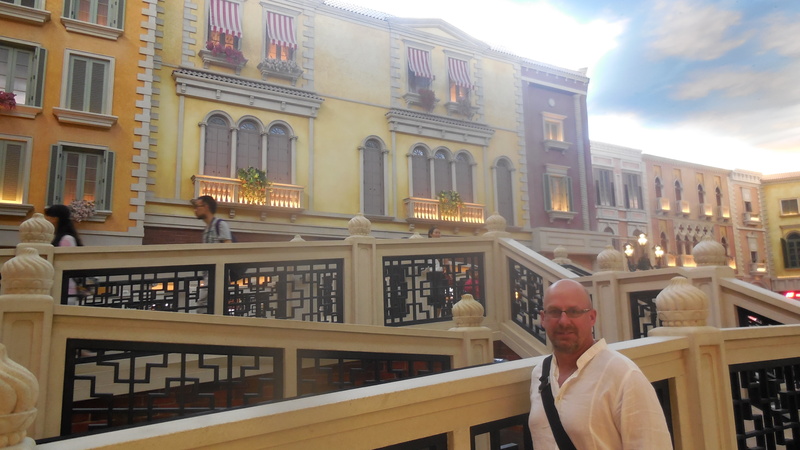 Having been to Venice before, we were somewhat in awe of the hotel’s magnitude and degree of accurate detail. 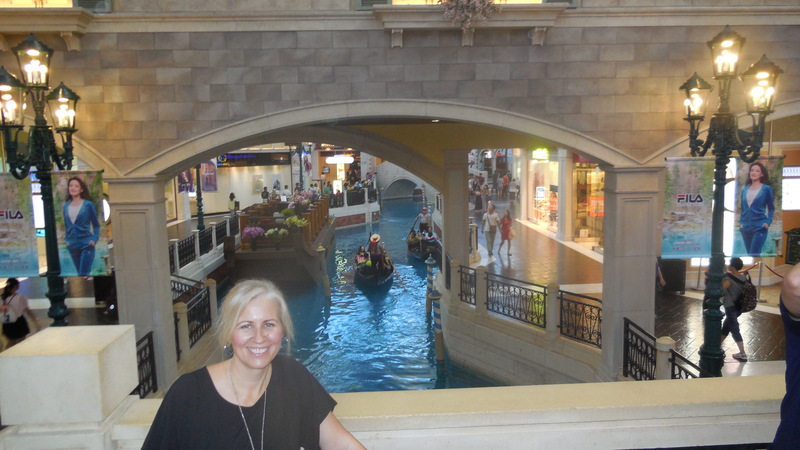 Upon our arrival in Venice many years ago, Rob quipped, “who the f@#k builds a city on water” when it became clear it was not easy to find your way around. 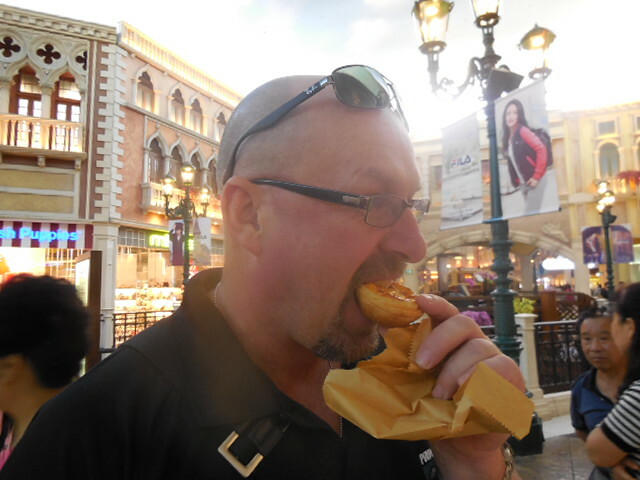 Apparently the Venetian is no different. 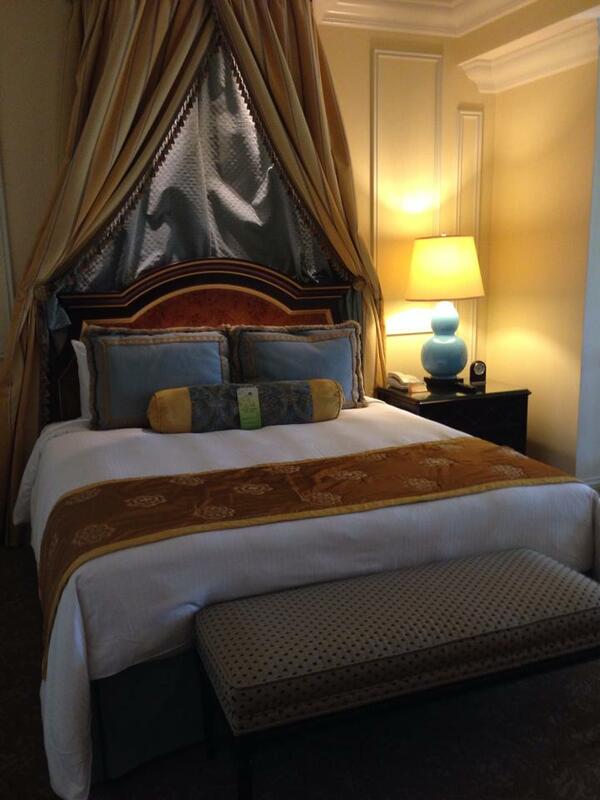 You can spend hours wandering the hotel. And getting lost. Or pushing through the thousands of people. 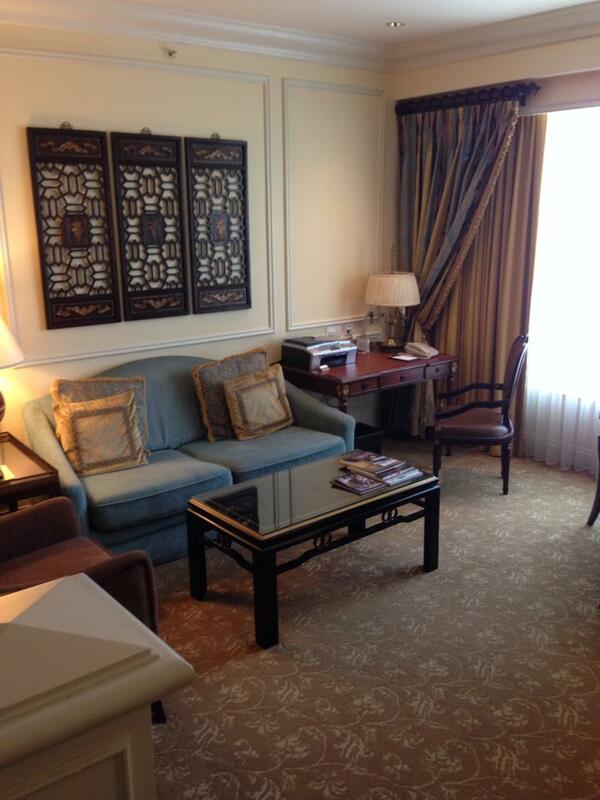 That’s why you have a suite – to escape. 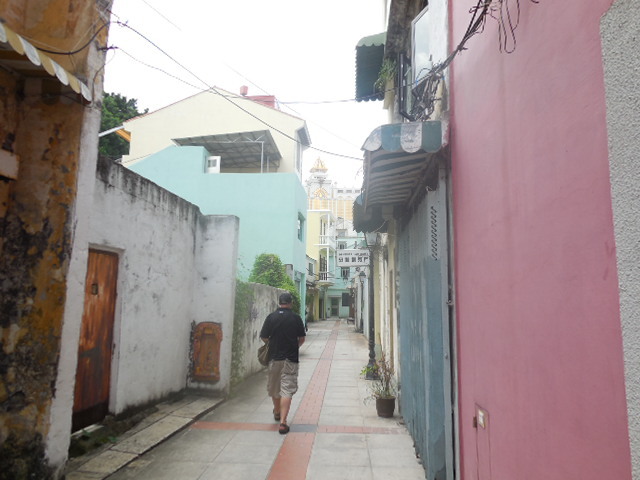 That said, it is easy to get around Macau. Most of the hotels provide free shuttle services and cabs are readily available. 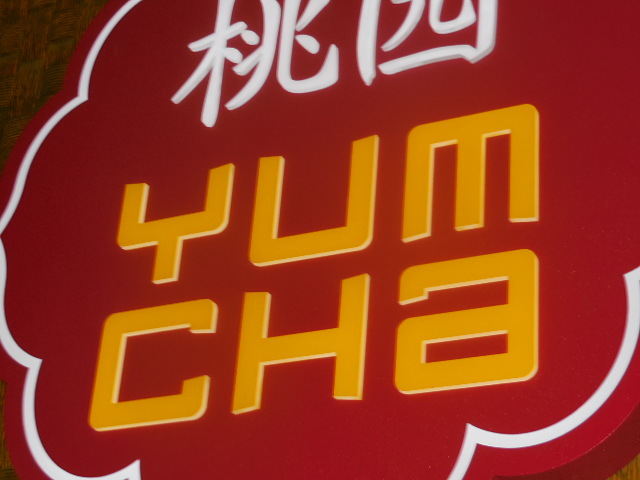 Yum Cha, Dim Sum……whatever you want to call it, it’s a dumpling paradise. 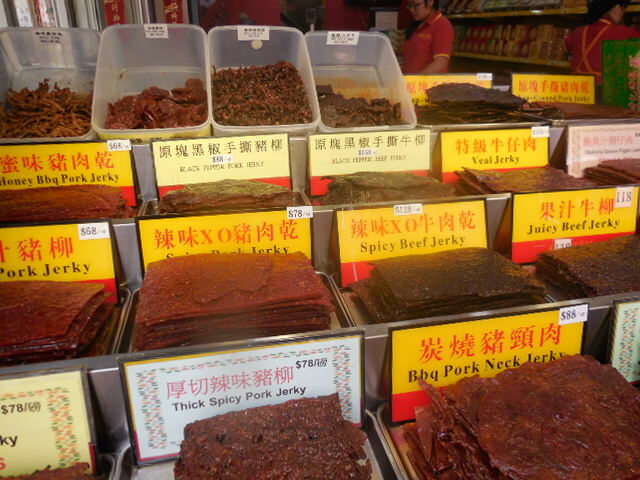 In Taipa Village, we recommend Koi Kei Bakery, Tai Lei Loi Kei, Seng Cheong Restaurant, Pui Kei Café or Mok Yi Kei. 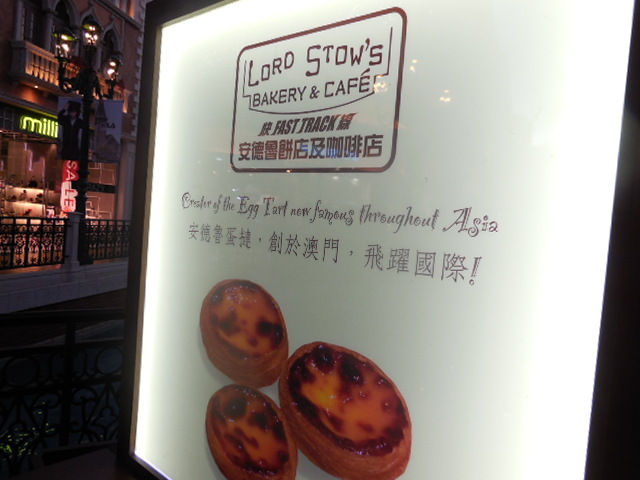 From Lord Stow’s famous Portuguese egg tarts to almond cookies to durian ice-cream to Pork Chop buns to Crab Congee, Macau had everything that appeals to us. 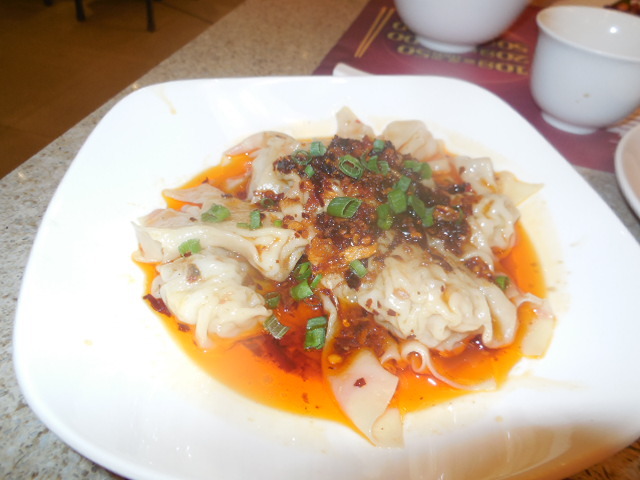 I ate dumplings. I returned as one. 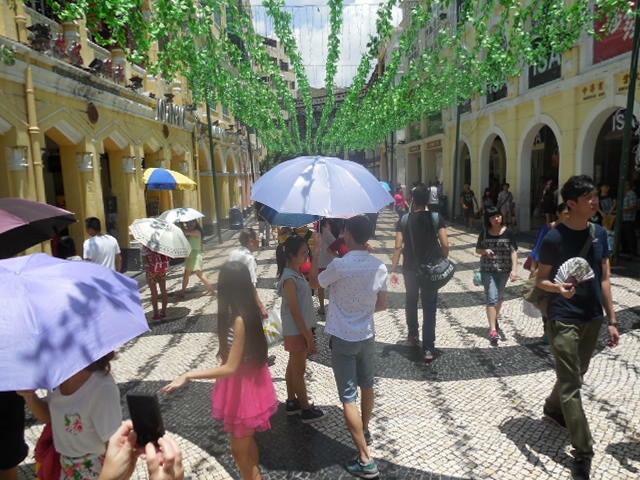 Paved with traditional Portuguese mosaic and framed by a canopy of greenery, Senado Square (Largo do Senado) is the centre of Old Macau. 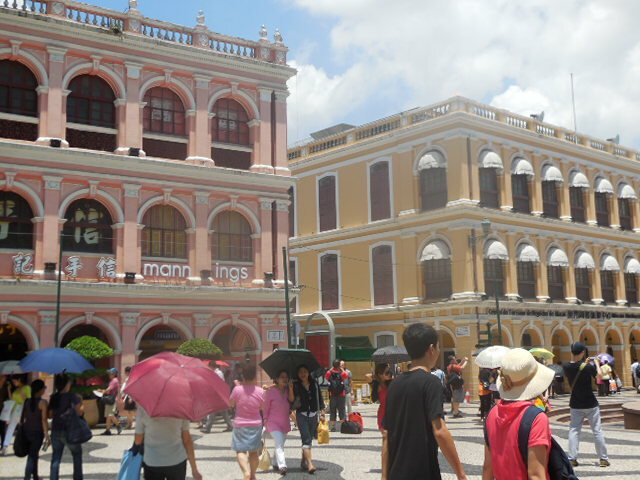 It used to be the official civic square of Macau when it was still a Portuguese colony, but today it is a popular tourist attraction and a UNESCO World Heritage listed site. From the square, you follow the thousands of others (typically under an umbrella), walking the route to the Ruins of St Paul. 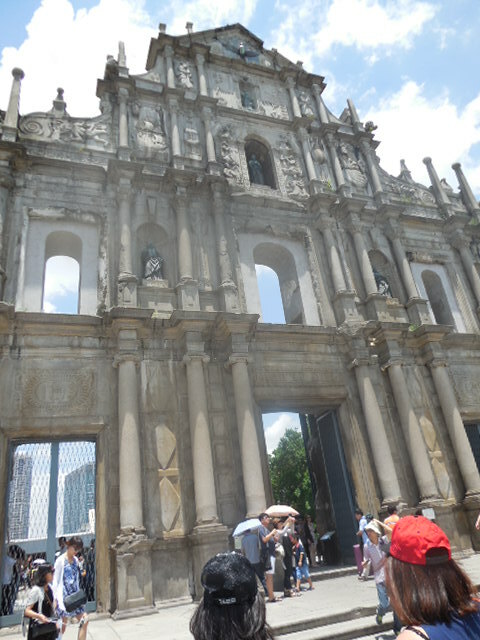 Built from 1582 to 1602 by the Jesuits, the cathedral was one of the largest Catholic churches in Asia at the time. 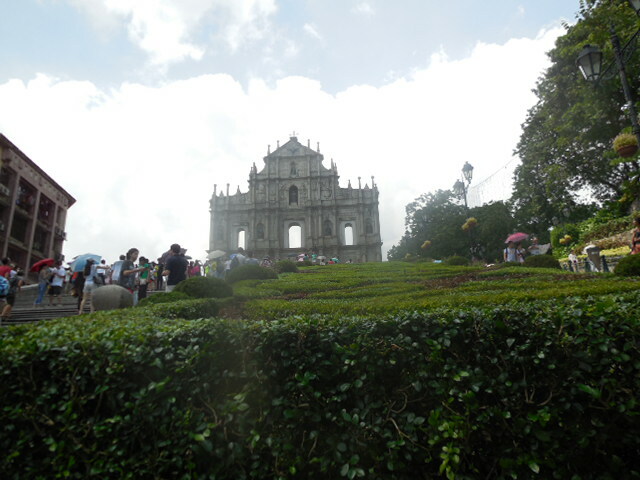 With the decline in importance of Macau, which was overtaken as the main port by Hong Kong, the cathedral’s fortunes similarly ebbed, and it was destroyed by a fire during a typhoon on 26 January 1835. 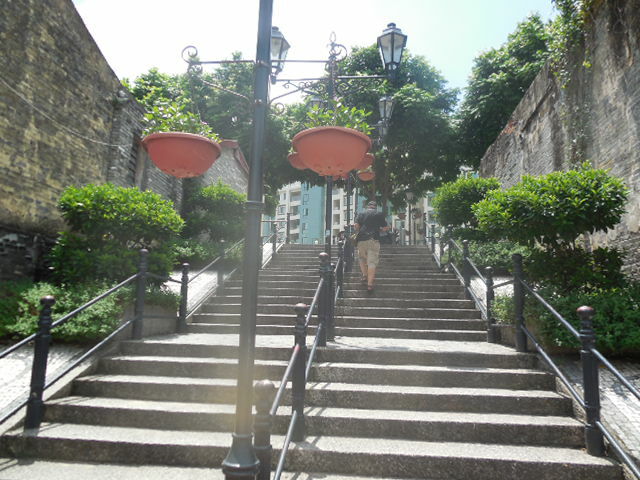 Further up the hill, you’ll climb the steep stairs to the Mount Fortress (a former Portuguese military stronghold) and Macau Museum. 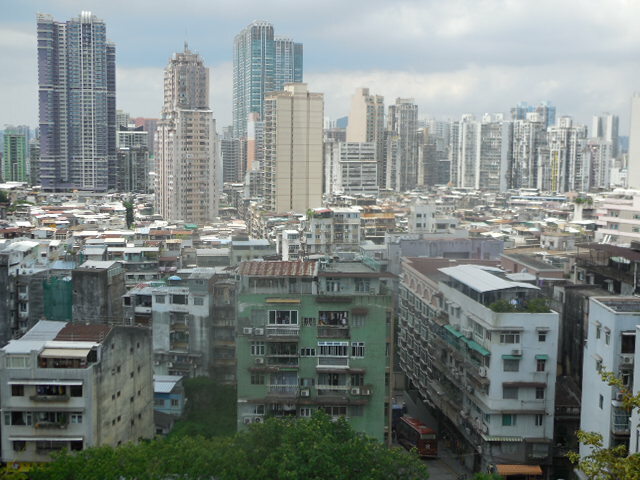 From there, you get a stunning aerial view of Macau Peninsula. 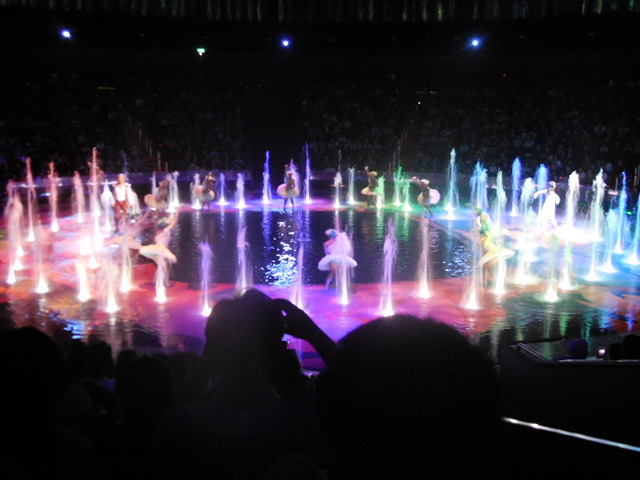 Recently named one of the top five productions in the world, House of Dancing Water has now been seen by over two million people since it opened four years ago. With a central stage that transforms into a 17 million litre pool, stunning sets, dynamic music (some recorded, some played from a lit room above the audience), and a cast of 80 gymnasts, ballerinas, divers and freestyle motocross stunt riders, it has to be seen to be believed. It also has a storyline so bizarre that I couldn’t explain it even if I wanted to. Definitely a must see. 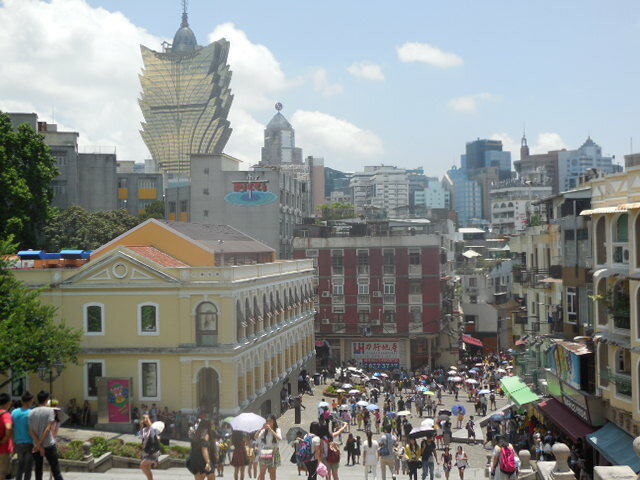 By plane: The Macau International Airport is located at the eastern end of Taipa Island. 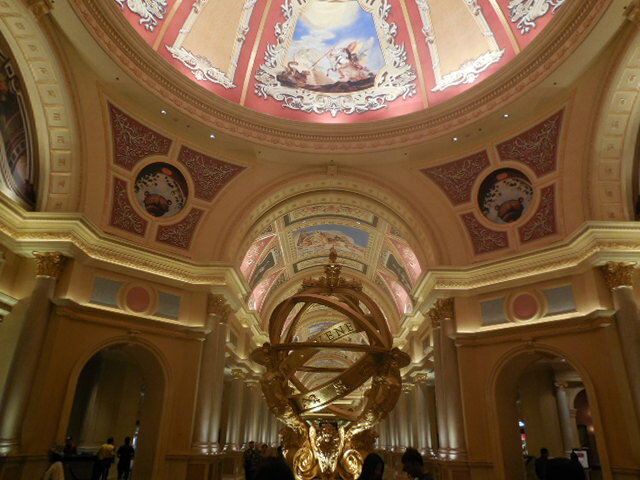 The Venetian Macao is just a five-minute drive away. By ferry: Your bags will be automatically transferred to the ferry once you disembark your international flight and there is no need to clear customs in Hong Kong. Return ferries can be booked directly through your hotel (which will also offer a free bus transfer service to and from the terminal). 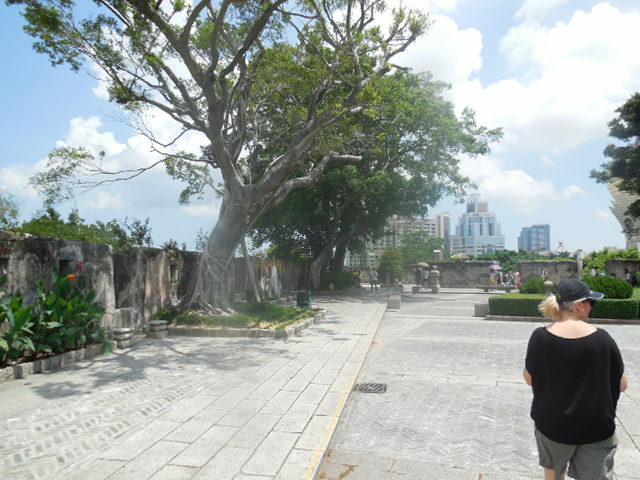 Macau is separated into two main parts: Macau Peninsula and Taipa Island/Cotai/Coloane Island. 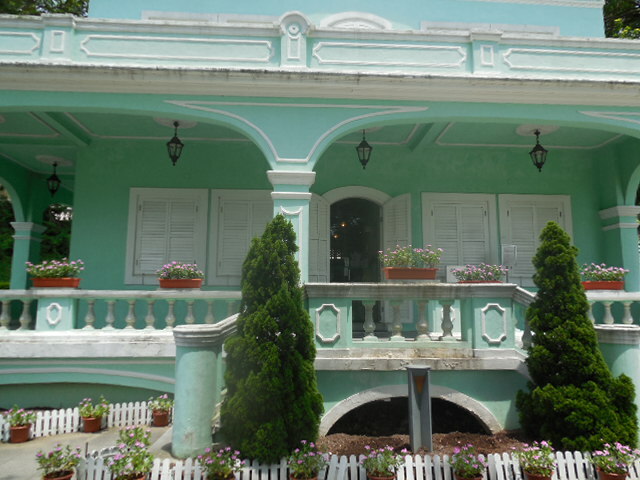 Macau Peninsula houses attractions like Senado Square and Ruins of St Paul. 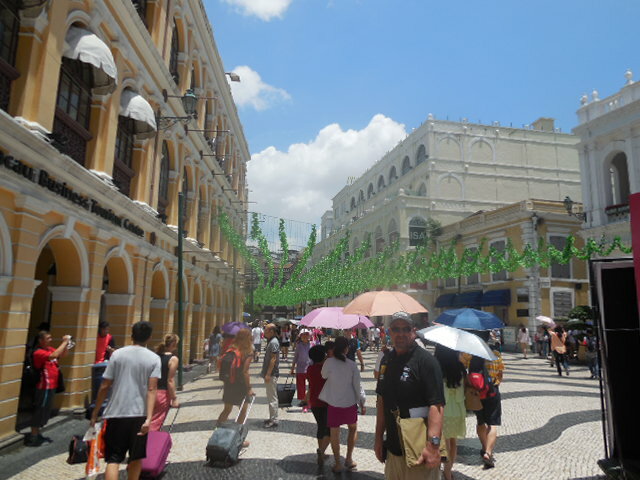 If you stay on Macau Peninsula in hotels like Hotel Lisboa or Wynn Macau or MGM Macau, you will be within walking distance from Senado Square. 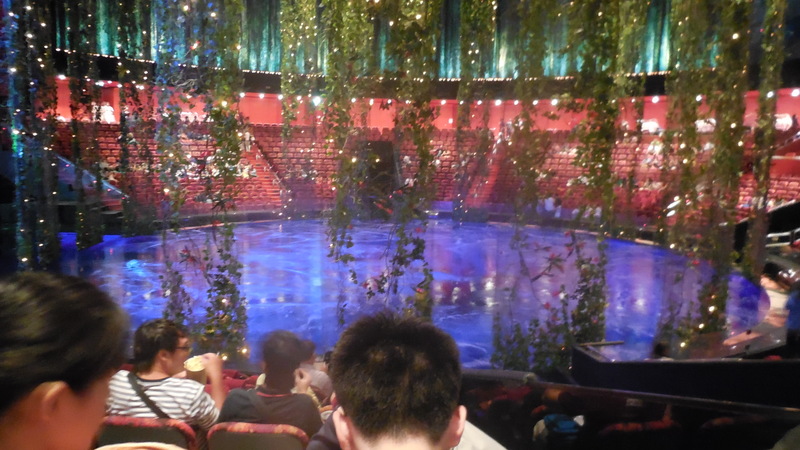 Cotai is an artificial land mass created by land reclamation. 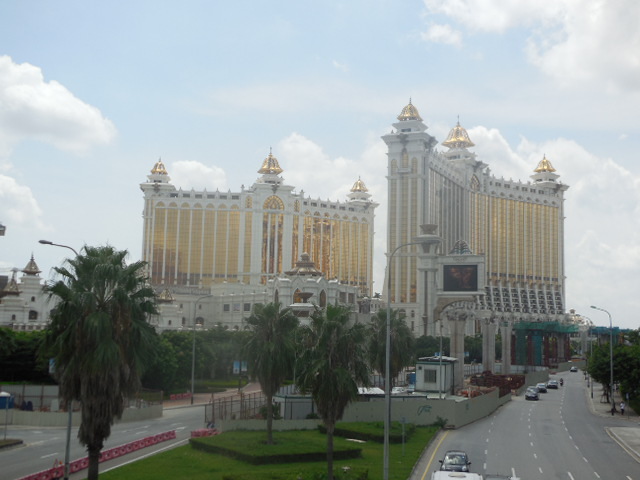 It houses the famous Cotai Strip, where hotels such as the Venetian and Galaxy Hotel are situated. 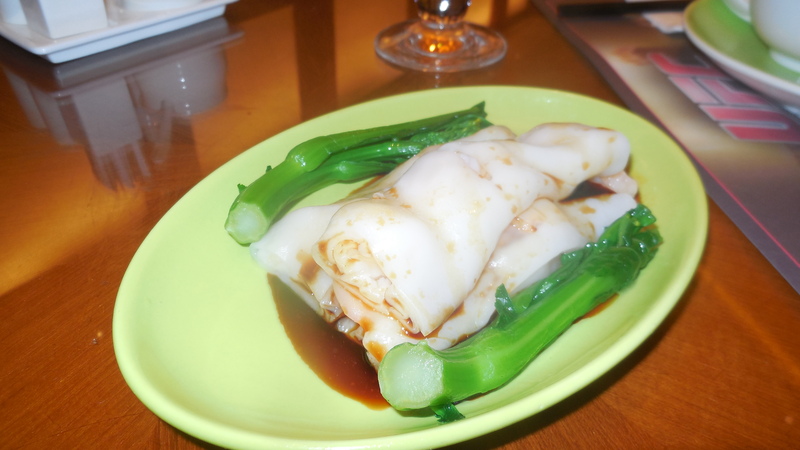 Here, you are within walking distance to Taipa Village. The two main parts are connected by three bridges.